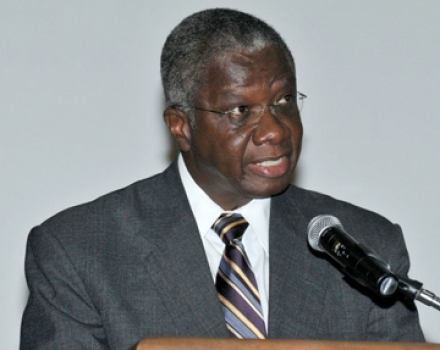 Prime Minister Freundel Stuart says his Government is not playing blind man’s bluff with the country’s economy. He told a Democratic Labour Party St Andrew branch meeting at The Alleyne School last night his administration was putting the necessary structures and remedies in place to put the country on sound footing, but he also warned that the restructuring process would take some time. “We didn’t get to where we are overnight, and we’re aren’t going to get from where we are overnight either. The foundation for a return to growth has been laid and I am confident that we will get there. We need to streamline Government operations, and we are doing that. “Where statutory [institutions] and so on are performing functions that overlap with other statutory boards and inefficiencies are in the system, we are dealing with that. We are making sure that people who leave home on mornings to go to work in the Public Service come and do an honest day’s work for an honest day’s pay,” Stuart said. He told an audience, which included Speaker of the House of Assembly Michael Carrington, that the process would also require Barbadians to put in the hard work and make sacrifices. While making no specific mention of criticism levelled by senior Cabinet minister Dr David Estwick, who holds the Agriculture portfolio, the Prime Minister reiterated that his administration was “putting necessary structures and remedies in place to put the country back on sound footing”. “If you announce that you’re pursuing a course, you have to show that you believe in the course upon which you’ve embarked. You can’t be vacillating and changing today and changing tomorrow. “That’s why we build a house with a plan. If you start to build a house and everybody that pass[es] by tell[s] you how the roof should look and you take that advice, the house will never finish. So that’s the route we’re going, and I am sure that it will yield the kind of success to which we all look forward,” he said. Meanwhile, Stuart has hinted that Barbadians will be given a clearer picture of the country’s economy when the Estimates are debated next month. “In the upcoming Estimates Debate that will take place in the middle of March, we will put all of these things on the table. All . . . so that people will be clear as to what we came and found, and what the station has been since we were in office. “A lot of talk has taken place. I believe the other side has got the impression that because we went through the last five years and didn’t deal with any of this that it is . . . past tense. Not true. We did not need to deal with it, but it is going to be put on the table and people are going to be called to account,” he warned. He noted that this issue had also been a source of concern for the International Monetary Fund. “In fact, in one or two of its Press releases, the IMF came down on the previous BLP administration. In one or two [of them], they commented on the fact that there was the amount of off budget financing . . . that [it] was a matter for concern. Mr. Prime Minister, I wish to God that you will listen to yourself, though. Plans for economy will take time? Our patience ran out long, long time ago. We as Bajans will not stand for your sleep and slumber anymore. It’s time to wake up and smell the coffee and put your best foot forward or else, as we all said before, IT’S TIME TO GO!!!!!!!! That would have been relevant 6 years ago and if no other caribbean island was showing signs of coming out of the recession but it isn’t. this statement is every political parties’ dream; that they would love masses (people) to embrace…..their taking time ! Ryan Bayne you hit the nail on the head.